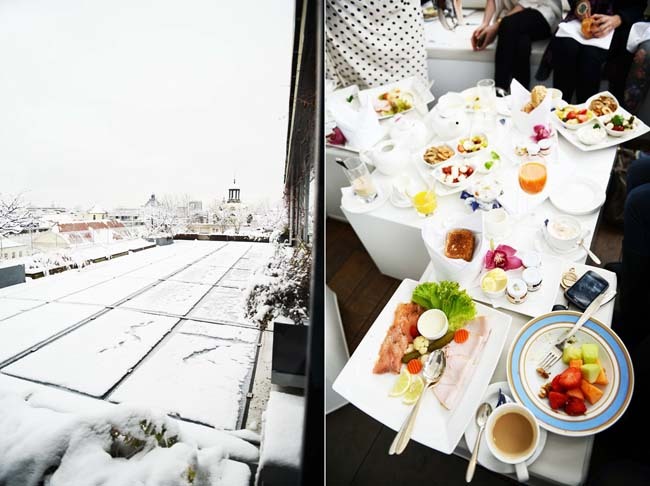 SUNDAY BRUNCH AT THE BLUE SPA BAR During out Stylight experience and journey we had the occasion to stay at one of the most gorgeous hotel in Munich : the Bayerischer Hof. James and I had several times the great opportunity because of the blog to visit some amazing places and especially breathtaking hotels who provide us with a lifestyle experience that we cherish so much are so gratefull for. I must admit therefore that the Bayerischer Hof was one of the most beautiful we have ever been to. A very classic, chic and luxurious style surrounded the atmosphere yet some particular spaces had a much more modern and design feel such as the Blue Spa bar where we enjoyed a goodbye brunch all together with the bloggers and the Stylight team. The ambiance was incredibly cozy, with the futuristic fireplace and the white furniture : everything seemed so polished, pure and got me into a deep relaxing and cocooning mood. Not to mention that the snow has covered the whole city so it matched perfectly to the interior design. We were surrounded by white from all perspectives. We enjoyed, all together, the most delicious breakfast brunch while talking about the highlights of this great weekend in Munich. All of us were fascinated by the beauty of the hotel and simply didn’t want to leave, some others rushed to the spa which was more that beautiful. It also gives you a perfect view on the whole city while swimming. One word : paradise. So though we really didn’t plan to take our swimsuits with us, some just went in underwear. You can’t miss an occasion like this one right, especially knowing that you are swimming in a hot water while winter is making it’s way through Munich. A dream. Of course James and I took advantage of this relaxing time to go out on their beautiful terrace and snap a couple of pictures. My outfit was over the top simple, the fact is that I just woke up, didn’t even dry my hair, and come right away to the brunch. Sometimes there’s no need for jewerly or accessories. I was feeling so comfortable in my Isabel Lu sweater, it was warm, cozy and perfect for the occasion. Gorgeous and stylish as always!! LOVE your sweater, it's amazing! This is probably my favorite shoot of you so far. You blend in so well with the snow, and the photos are looking so crisp and tranquil! Kudos again to you and James! This place looks so cozy !! ANd you look perfect ! The board is so cute, looks like a fun time in Munich! I love the outfit! Munich is my favourite place in Germany, very beautiful city. Fantastic pictures!! You look great. Love the cosy feeling of the photographs! I think u are amazing!! Your outfit is beautiful !! wow all of it, including you, looks amazing! What a breathtaking view and atmosphere! It definitely looks like loads of fun and just so magical. Love your outfit! The snow look so so pretty. Beautiful outfit!! The snow!! Looks great!!!! Nice outfit!! You are gorgeous once again girl!! love the pics and your sweater, honey! wow, really amazing pictures, beautiful outfit! One of the most beautiful posts :) The snow has such a calming effect! And your outfit is really nice! Congrats both to James and to you for the amazing pictures! such great pictures! absolutey love them! hope you enjoyed your stay in germany! Absolutely beautiful outfit hun. Black and white is perfcet together. love the two toned sweater and outfit! gorgeous shots. it seems like winter came early this year!! I saw from your photos on Twitter that it was snowing in Munich! Can't believe the temperatures there were already so low. Loved your outfit by the way! please answer questions but not in video cause most don't understand english very well, what mositure do you use only the clinic one dramaticly something ? Your shirt is stunning, and the shoes so pretty! My gosh, snow already?! But you definitely look fabulous! Looks gorgeous! love the outfit. Love the color block sweater, looks perfect! Stunning pictures,Really love the outfit and a snowy day is a perfect backdrop for it! That sweater is amazing on you. So winter appropriate. Both you and the hotel look stuning! Your look are amazing, and the place... cool! love you on photos so much. how do you make it to look good on pictures? Plus, I love your outfit. You look great as usual. Tu es superbe ! J'adore la deuxième photo ! amazing pics, you are so adorable! Such sweet pictures - well, they always are :) I'm so in love with your outfit. Your really know how to rock a black and white outfit. I love the sweater! Cold weather, but so beautiful!!! i'm from zurich and i totally enjoy ur blog! sometimes u have rather obvious spelling and grammar mistakes in ur texts. i'm no pro but quite practiced at english (proof-reading as well) so i was wondering whether you might be interested in a lecturing cooperation? Kristina your look here is so amazing! Pretty outfit and make up! If some one wishes to be updated with most recent technologies after that he must be visit this web page and be up to date every day.